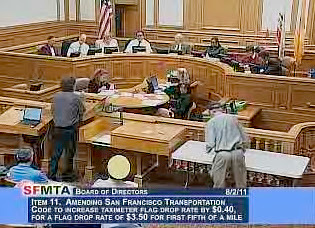 SF Taxi Media: MTA Approves Flag Drop Increase, And Authorizes 87 New Medallions. By John Han. MTA Approves Flag Drop Increase, And Authorizes 87 New Medallions. By John Han. The MTA Board of Directors gave San Francisco taxi drivers a 40 cent increase in the taxi meter flag drop rate at its Tuesday regular meeting August 2nd, 2011. This means that passengers will pay an increased starting rate from $3.10 to $3.50, when entering a cab. The flag drop meter increase comes on top of a previous distance and time rate increase approved in May. According to the SF Examiner, the total increases will mean that a three mile cab ride with a three minute wait time will go up from $10.75 to $12.85. And, according to The Sacramento Bee, an average trip from downtown San Francisco to SFO will go up from about $35.00 to $41.00. The rate increase was approved by the Board unanimously. It is the first raise that taxi drivers in San Francisco have received in eight years, and will reportedly go into effect in about 30 days. The MTA also voted overwhelmingly to issue 87 new medallions. This will will include 50 "single operator" medallions, 35 full-time regular medallions, and 2 electric taxi vehicle medallions. Director Bruce Oka was the dissenting vote in a 6-1 majority vote, citing the new 50 "single operator" medallions as the grounds to oppose. He was in favor of more full-time cabs. Oka had also previously said in a May 17th Board meeting that a meter increase should not be granted without a gate increase to the cab companies. Oka is full of kaka. I'm a bit confused as to how many of these cabs are going to the people on this list, maybe you could shed some light on that. Mick. Meanwhile as inflation is raging, we drivers see our wages deflatiing! 25 full time taxis are supposed to go to the waiting list. 10 are supposed to be sold by the SFMTA to taxi drivers on the waiting list. 50 single operator taxis are supposed to be leased to taxi drivers with A card seniority. The SFMTA capitulates to the lowest common denominator of public ignorance, believing that more cabs means better service. Malcolm Heinecke is confidently leading the "Single Operator" cab drivers into a "gypsy cab" future, knowing, and desiring, that this will ruin the cab companies - not to mention the quality of life of the gypsy cabbies driving "peak time." The SFMTA is now in the CLEAR CONFLICT OF INTEREST business of selling medallions as it sees fit. Don't think this is the view of someone who runs a cab company. I don't. The dissenting vote from Bruce Oka was the only reasonable vote. THERE WAS NO DISCUSSION OF THE MOTION: it was known in advance what would be done. Board member Joel Ramos cited the few people who agreed with the (predetermined) Board decision as having spoken "eloquently." THE MANY MORE DISSENTING SPEAKERS WERE IGNORED. Do we thank Ramos for expressing his favoritism so clearly? The SFMTA also turns its deaf ears to Open Taxi Access, which it killed, and which, if properly designed, would be the "Google Maps" of the cab industry; it also is blind to the notion that before throwing more spaghetti on the wall, in the form of "more cabs means better service," it should do industry studies... which it shows no interest in developing through the use of the information that could be available using electronic data collection. Only Deputy Director Chris Hayashi's office tries to get it right, but when asked why the proposal she put to the SFMTA did not resemble the one that it seemed had been cobbled together at the Town Hall meetings, she could only tersely say, "My bosses wanted it [this version, not the consensus]." In other words, the SFMTA Board does not allow itself to be told anything it doesn't want to hear. I attended every Town Hall meeting skeptical (like many others) that it would do any good, with the back-up reason that I would have a reasonable view of the process. Only the back-up plan was worthy. The only reason to attend Town Hall meetings is to chronicle the corruption of the SFMTA. Bruce Oka is a Cab company guy and one should admire him to stand for this position. Christoper likes him but also like everything which is against the cab drivers. One individual claiming to be coming to each meeting but why people should listen to you or follow you when hundred others got different ideas than yours. UTW and you together are supporting electronic waybills while 99.98 % of drivers are opposing it. Out of 7500 drivers, how two/three or ten people can be better when all others are rejecting your support of Christiane and ideas. OK, pardon my ignorance, but what is a "single operator" medallion verses a Full Time Medallion? And in some cases have interests (shares) in the company itself.